Combine the pineapple, guava and orange juices in a large, clear pitcher. Refrigerate. Place all the chopped fruit in a large bowl and mix together until everything is well combined. Then place all the fruit in the pitcher with the juice mixture. Add the kola and grenadine to taste. Mix with a wooden spoon. You can add an elegant twist by serving each glass with a fresh watermelon ball kebab. If you wish, you may add a touch of condensed milk when you serve it. Martha Salas This beverage is great to serve at your celebrations. It’s refreshing and delicious thanks to its tropical flavors and tasty chunks of fruit! A well-chilled tizana is just perfect to help your guests freshen up after an afternoon in the pool. It’s great for children’s or adult parties, or for barbecues. 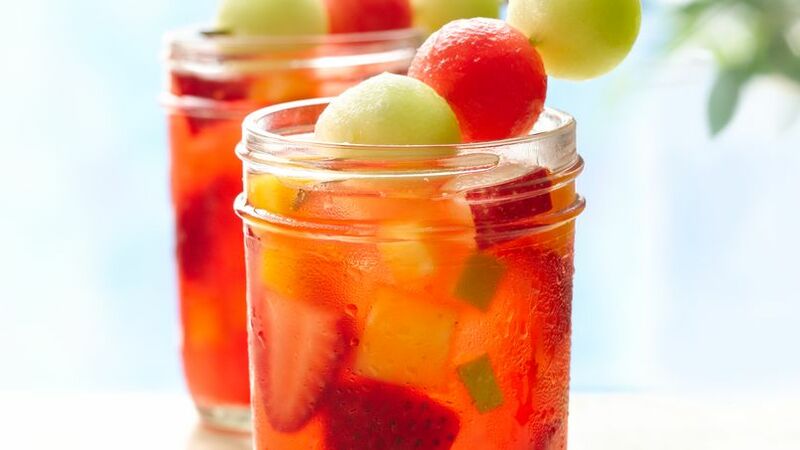 If you add more fruit to the liquid, it’s also perfect as a snack or dessert.